Method 1 : Dilute two tablespoons of Pearl with 10 litres of warm water into a bucket (1 part Pearl to 300 parts hand hot water.) Apply the solution generously with a sponge or cloth. 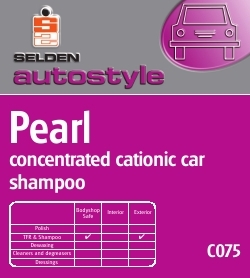 Method 2: Pour some Pearl concentrate directly onto a wet sponge and apply neat to the vehicle. Rinse vehicle with clean water and allow to dry. Product is best applied out of direct sunlight. Composition Aqueous blend of surfactants and free rinsing additives together with viscosity modifer, dye and perservative.